Charity Case™ - The Hottest Cover Band in the Land! Over $1 million is a lot of money. It’s even more money if you’ve given it all away. That’s the amount of money the members of Charity Case have both raised and given away in the past fourteen years. But how did it get here? How did it get from an idea on a radio show to a lifetime of memories? That is a story in and of itself. Any discussion of Charity Case™ and its origins should begin with the television show Making the Band. Ace, one of the hosts on the Ace & TJ morning show, had always wanted to play drums and be in a rock band but, having no musical ability, he had never followed up on this dream. After watching a few episodes of Making the Band, Ace was challenged by the other show members to form a rock band comprised of members of the Ace & TJ Radio Family. He was amazed at the number of responses, especially considering that there was no money in it for anyone in the band. Ace had been given Eddie Z’s name as someone to call for rehearsal space. It was during that original meeting at the The Playroom when Eddie Z showed an interest in being a part of the band and helping Grin Kids. As a result, Eddie agreed to become Music Director of this band that didn’t even really exist yet. What’s so different about that? Lots of bands don’t make money. The difference is, with Charity Case, the reason the players don’t make money is the very reason they play…to raise money for Ace & TJ’s Grin Kids. Grin Kids is a 501(c)3 charity founded by the Ace & TJ Radio Show for the sole purpose of taking a planeload of kids who are terminally ill and chronically disabled, along with their entire family, to Walt Disney World. Each year Grin Kids takes these families on a “once in a lifetime, all expenses paid, dream vacation”. Charity Case, which began as a radio bit, quickly became a way to raise money for Grin Kids. The money the band and crew raise at each show goes to Grin Kids. Each band member plays for free and each crew members devotes his/her time to setting up and tearing down the stage and sound for each show all to help raise funds for these very needy kids. Since making their debut on June 16, 2001 in front of 1,200 people at a sold-out Second Chance Prom in Charlotte, they’ve come a long way. 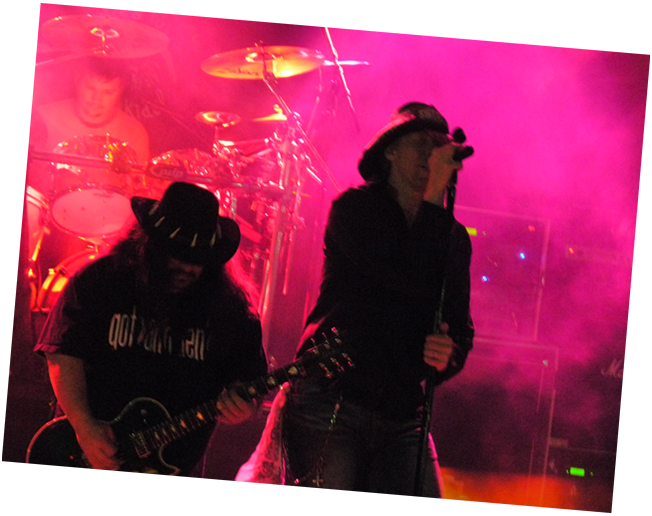 In addition to selling out shows all over the region, the band has also opened for and played with such national acts as Bon Jovi, Train, Bret Michaels, Nelly Furtado, LL Cool J, Joan Jett and many others. Charity Case has also headlined shows at every arena in the Charlotte, NC area, played before tens of thousands at various festivals throughout the region and sold out every club where they have played for more than two years. The band also holds the Friday and Saturday night records for attendance at Oktoberfest in Hickory, NC, which is where the band’s DVD “Blood, Sweat and Cheers” was recorded live in front of a record crowd of over 15,000 in October 2008. How would you describe a Charity Case™ show? It’s “an arena show in a club.” From the curtain drop opening of Thunderstruck, to the mix of current and classic hits, to the huge stage risers and incredible light show, it’s one non-stop party. From the moment the show starts until it ends two hours later it’s the most energetic, high energy show you’ll find anywhere, crafted with top quality musicianship and non-stop surprises that keep people dancing and singing along through the entire show. Mixing rock from the 80’s, 90’s and today, old school hip-hop that’s rocked out and even a dash of country, Charity Case™ keeps people coming and their shows sell out everywhere. It’s safe to say that Charity Case has seen a million dollars and rocked for all! Copyright © 2015 Charity Case™ All Rights Reserved.